This week we’re very excited to share a brand new part of Segment with you: the Schema. It’s the easiest way to organize and manage all of your customer data. We’ve talked to many of you about how you organize your analytics tracking. You’ve built everything from spreadsheets, to wikis, to full-blown internal web applications to keep teams on the same page about what’s being tracked and why. With the Schema you understand what you’re tracking inside Segment itself, and we’ll keep the active/inactive status of every event for you automatically. You can start using it today for any of your projects. Schema is a workflow for viewing and managing the customer data you’re sending to Segment. Inside your Schema, you can see all of the track events that you’re sending through Segment, and if they’re active or inactive. This should help answer questions like “what did we name that one event?” and “is our signup event still working?” that pop up when you’re working with a lot of data or have new folks join your team. The Schema isn’t only for viewing your data schema, though. You can actually disable events from being tracked right in the interface—without any code changes! Just click the off button to disable the event in Segment, and we’ll stop forwarding it to your integrations. You can remove it from your code at your leisure. 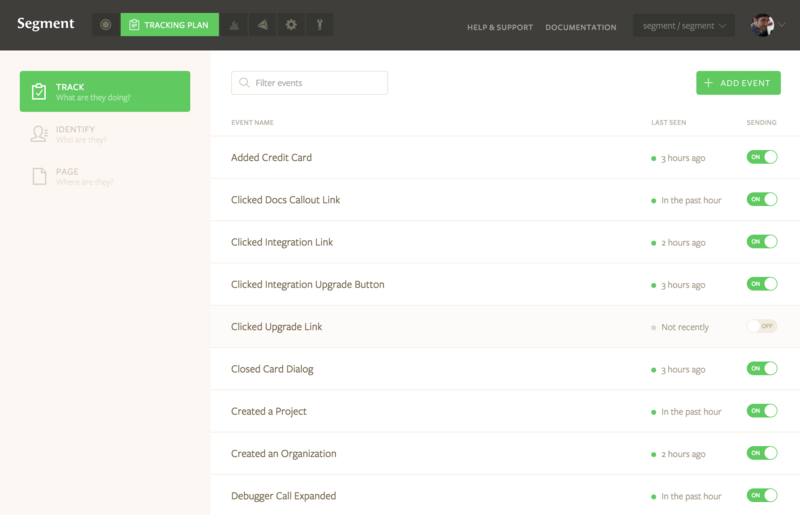 It’s as easy as turning on an integration on your Integrations dashboard. If you’re using our iOS or Android SDKs you’ll need to update to the latest version of the SDK. Analytics.js (browser) and server-side libraries are supported immediately. For a quick reminder on event best practices, check out Jake’s recent article about our own tracking plan. We’ll be adding support soon for our other API methods identify, page, and screen. And we’re really excited about some other additions that will make Schema even more helpful! If you have any ideas or questions, shoot us an email.